Seeing requires light, and what we are able to see often depends on the quality and type of light that illumines the world around us. When I was a teenager, we would have what we called black light basement parties. The black light gave off a ghostly, bluish glow that transformed the whole room and everything in it. Under the cast of the black light, some things that were hidden and unable to be seen in regular light were not only seen but glowed. I don’t know why we thought black lights were so “cool” other than the fact that they allowed us to see the world in a whole new way. 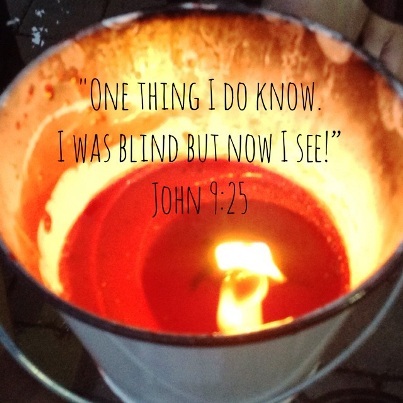 Seeing requires light, and Jesus tells us that he is the light of the world. To be a follower of Jesus is to see the world in a whole new light-- the light of God’s love, mercy, and forgiveness. To see the world through the radiant glow of the Lord Jesus Christ is to see the people who are often unseen and overlooked by the world. It is to see that many of the things that we deem important are not important at all. It is to see the humanity and dignity of everyone including those who would be our enemies. It is to see that we are all connected and that, when some of us are diminished in any way, we are all diminished. It is to see that the path to salvation is not through the stockpiling of weapons or the hoarding of material goods but through the self-giving love of the Lord Jesus Christ. Seeing requires light, and during the season of Lent, we are invited to bask in the radiant glow of God’s love as we make our way to the cross.